Photos: Ranbir Kapoor And Deepika Padukone Look Adorable Together At Tamasha Promotions! Home BOLLYWOOD Photos: Ranbir Kapoor And Deepika Padukone Look Adorable Together At Tamasha Promotions! 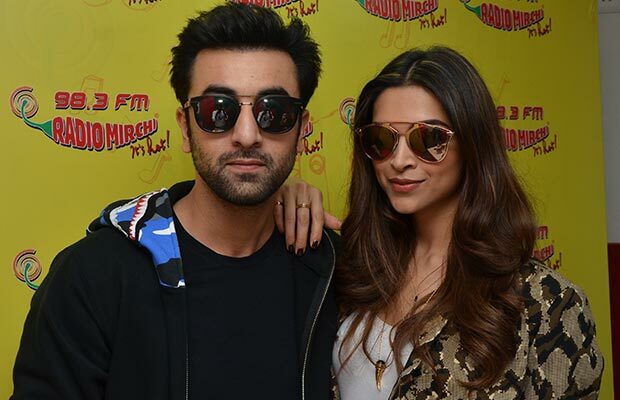 [tps_footer]Bollywood actors Ranbir Kapoor and Deepika Padukone were photographed during the promotions of ‘Tamasha‘ at Radio Mirchi yesterday. From interacting live with the audiences, to grooving to the famous song Matargashti from their film Tamasha, Ranbir and Deepika had a gala time at the promotions. Dressed in Forever 21 Joggers, Zara white tank top and printed jacket over it, Deepika Padukone looked causal yet classy. She finished out her look with delicate necklace from H&M and black heels. While her co-star Ranbir Kapoor looked charming in denim, black tee with zipper jacket. Both the actors visited several Radio stations for the promotions of the film. From dancing with the reporters out there, to talking live with the audiences on air, Ranbir and Deepika enjoyed a lot. The duo has always said that their journey of Tamasha has been a memorable one. It’s been an incredible journey for both of them. Deepika was alone promoting the film Tamasha and now that Ranbir is back from London, the duo is promoting the film together. The expectations with the film are quite high, as the film sees Ranbir and Deepika together after their last film Yeh Jawaani Hai Deewani. ‘Tamasha’ brings two ex-lovers back on the silver screen again and what more can you can ask for from director Imtiaz Ali. The film decodes relationships and much more. The trailer already makes us to watch more from the film and as we all know Ranbir and Deepika are known as golden pair of the industry and excitement among the fans to see them together once again is high! The film is slated to release on November 27, 2015.